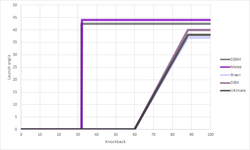 A graph of how the knockback of a Sakurai angle-attack affects its launch angle. Click for full-size version. The Sakurai angle (sometimes displayed as * or in moveset lists) is a special knockback behavior that many attacks use. While it reads in the game data as an angle of 361 degrees, the actual resulting angle is dependent on whether the victim is on the ground or in the air, as well as the strength of the knockback. The exact characteristics of the Sakurai angle have changed slightly in every game, but all share the same basic idea: at low knockback the opponent is not lifted off the ground, while at high knockback they are launched diagonally; the purpose seems to be to allow grounded battles between fresh opponents without allowing attacks to be deadly semi-spikes at KO percentages. The amount of knockback dealt determines the launch angle of grounded opponents; aerial opponents use the same angle regardless of knockback, which is typically very slightly higher than any grounded version. Starting in Melee, if the knockback is between the low-knockback value and high-knockback value, the resulting angle will be linearly scaled between its two extremes. The Sakurai angle does not correctly tilt the impending angle indicator; it will remain at a flat angle. While a low-knockback grounded hit of a Sakurai angle-attack is technically a semi-spike, it can never be used as one due to edge slipping. The characteristics of the Sakurai angle are mentioned by the official Super Smash Bros. website; it mentions that when an attack's angle is 361, low knockback hits the opponent sideways while high knockback hits them diagonally. The angle is not given any special name, and due to the statement's presence on an obscure page on a Japanese-only website from 1999, the community was never aware of it. Indeed, for the longest time in the history of the series, there was no knowledge whatsoever that a special angle existed - only a slight sense that one knockback angle felt more common than others. Early in Brawl's lifetime, it was noticed that many attacks with the "generic horizontal launch angle" appeared to have a low chance of tripping. As decoding of moveset data progressed, it was discovered that most of said attacks have an angle of 361, and later that their technical trip chance was 0%. Seeing no other explanation at the time, the community agreed that the special angle was the source of the extra trip chance. As Masahiro Sakurai is somewhat infamous for being commonly thought to have made tripping existent in Brawl, the angle was named after him. While it was later discovered that all attacks that leave opponents on the ground have an extra chance of tripping, and it was not the special angle's doing, the name stuck. With the release of future games in the series, the Sakurai angle has proved very valuable for data miners; since the number 361 (or 0x169 in hexadecimal) appears commonly in attack data and rarely elsewhere, searching for it is an extremely effective signal that the data surrounding it is a hitbox of some sort. This page was last edited on April 19, 2019, at 11:41.